An old man in a bowler hat stands in the corner reading a day old newspaper, a couple of smartly turned out waiters slap espressos and macchiatos down onto the bar counter, and a hand-painted portrait of a fiercely roaring lion explodes out from one wall. Nothing seems to have changed in Tomoca since at least 1952, but outside this legendary old Italian-style café the world is advancing fast, and so too is Addis Ababa, the bursting-at-the-seams capital of Ethiopia. 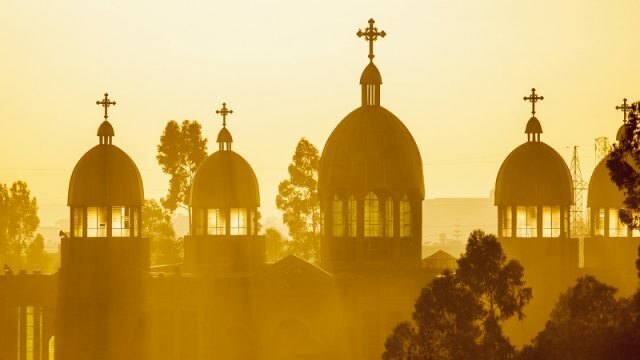 I first visited Addis way back in early 1994, just three years after the fall of the Derg, a Marxist dictatorship which had soaked the country in blood for nearly 20 years. On that first visit, Addis still appeared to be in a state of shell shock over the dark days it had just endured. Marxist monuments still stood proud on central roundabouts and plazas, and the city was run down and struck in poverty. My strongest memory from that first visit to the city was of sitting on my backpack under the arches of the National Theatre wondering where I could find a cheap hotel (this being well before the first guidebooks had been written to the country), as a dozens-strong crowd of people, chanting “faranji, faranji” (foreigner, foreigner) encircled me. Occasionally one of my onlookers would rush forward and pull my hair or jab a finger at me. I was eventually saved from this torment by a man with a bullwhip who strode over and lashed furiously out at my audience with his whip. When they’d been beaten back he spun on his heels and simply marched away without the slightest acknowledgment. 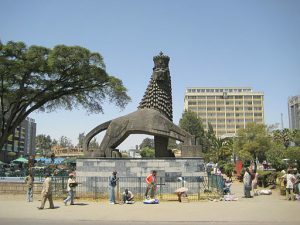 Even with his rather violent aid I have to admit that my first impression of Addis didn’t inspire love at first sight. That first visit to Ethiopia was tough throughout. I got very sick and spent what felt like endless days and nights in a nauseous state of semi-consciousness in flea-infested, straw-floored hotels which doubled as brothels (or perhaps they should better be called brothels that doubled as hotels!). I saw little of the country and didn’t know how to make sense of the things I did see. In reality, I was an out-of-my-depth teenage backpacker who’d gotten lost on the way to Goa or Thailand. But despite all this, Addis, and Ethiopia in general, cast a spell over me that has lasted to this day and drawn me back again and again. Fast-forward some 20 years and Addis is a very different city from the one I first knew. Gone are the hair-pullers, bullwhips and cheap hotel/brothels (well, most of them anyway). Instead, for me, Addis today is a city on the move and the capital of a nation on a steep upward trajectory. For me arriving back in Addis today means clinking wine glasses with local friends in any one of the numerous city slick restaurants serving Mediterranean vibes and tarted-up Ethiopian classics. It means gasping over 4,000 years of historical treasures in some of the finest museums in Africa. 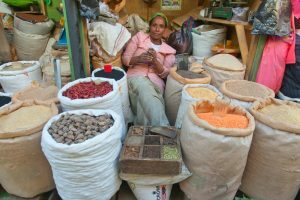 It means listening to birdsong on a warm afternoon in the forested hills that hug the north of the city, or taking in some live Ethio-jazz in one of the city’s growing number of bars and live music venues. Even though Ethiopia lagged behind much of the rest of the world for the better part of the 20th century, the Ethiopians were never less than convinced that their country was a player on the African and world stage. Today, that strength of feeling is paying off and Addis is fast emerging as one of the most influential cities in Africa. It’s a place where, as a frequent visitor, I get the sense of money being made, opportunities emerging, and old cultures disintegrating. It’s also one that seems to be changing by the day. The government has launched a massive sprucing-up and modernisation programme, and this means that every time I land back in Addis the cityscape has changed. New roads might have been laid, freshly constructed tower blocks sparkle in the morning sun, and just in the last few months, a brand new suburban train system has come into operation. Addis isn’t yet Nairobi, but if it continues like this, Nairobi might one day wish it were Addis. So in answer to the question as to why I love Addis Ababa– it’s simply the fascination of seeing the clash of old ways with new, the pleasure of watching the city develop from down at heel to buzzing cosmopolitan centre. And it’s drinking espressos in time warp Italian-era cafes. Stuart Butler is a writer, photographer and guidebook author. He has worked, travelled, written about and photographed numerous countries. The majority of his working life is spent split between fine dining in southwest Europe (mainly France and Spain), and exploring remote and little-visited regions of Africa and South Asia.